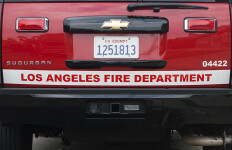 Fire tore through a commercial building in Anaheim Monday, sending a thick plume of black smoke over the city, but there were no reports of any injuries. The four-alarm blaze erupted shortly after 2 p.m. in an industrial area in the 1300 block of North Dynamics Street. 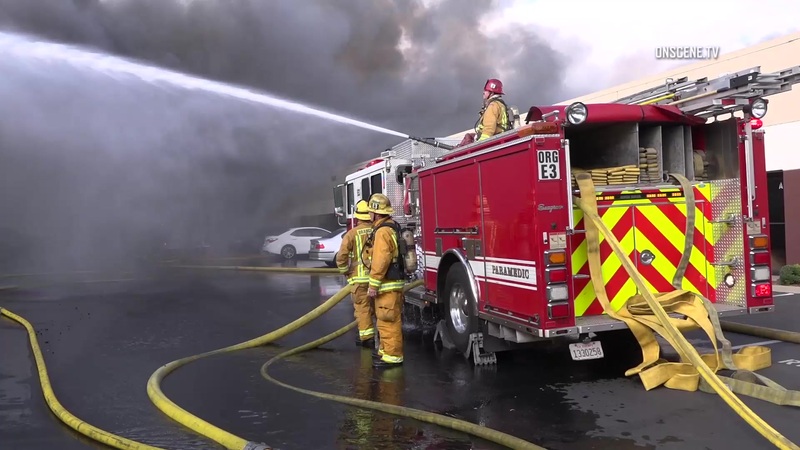 About 80 firefighters from throughout Orange County took about two hours and 15 minutes to knock down the blaze, which started in a business that converts vans into vehicles for the disabled, Anaheim Police Sgt. Daron Wyatt said. The fire started in one of the vehicles and spread quickly, Wyatt said. The fire was quickly upgraded to a fourth alarm. Anaheim Fire & Rescue was assisted at the scene by crews from Orange, Fullerton, Brea and the Orange County Fire Authority. A large section of the building’s roof collapsed, but the flames did not appear to spread to neighboring businesses. Westbound Miraloma Avenue was closed to all traffic at Miller Street to accommodate the firefight. While battling the blaze, firefighters noticed a United States flag catch fire so they yanked it down and saved it, Wyatt said. The flag, which was owned by a Los Angeles Police Department officer, was returned to him in “great condition. They got it before it was damaged,” Wyatt said.